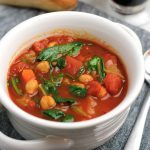 Comforting and satisfying, filled with both sun-dried and crushed tomatoes with hearty chickpeas, perfect for warming you when it’s cold out. Heat a large pot over medium heat, add 1 tablespoon extra virgin olive oil to the pot. Toss in the onions, celery and carrots and stir. Season with salt, pepper and fresh herbs. Continue to stir until veggies are slightly softened, about 3 to 4 minutes. Add garlic to the pot and sauté another minute. Add stock, sun-dried tomatoes, crushed tomatoes, chickpeas, smoked paprika, tomato paste and crushed peppers or flakes to the pot. Bring to a boil, reduce to a simmer. Cover and continue to cook until veggies are tender, about 15 minutes. Add more stock if the soup is too thick or dry. Remove from heat, stir in spinach and arugula, cover and allow greens to wilt. Serve soup with crusty bread alone or over a grain of your choice. If you’re not vegan you can garnish with grated parmesan. For an extra boost of protein serve over brown rice, pasta, quinoa, barley or any grain of your choice.